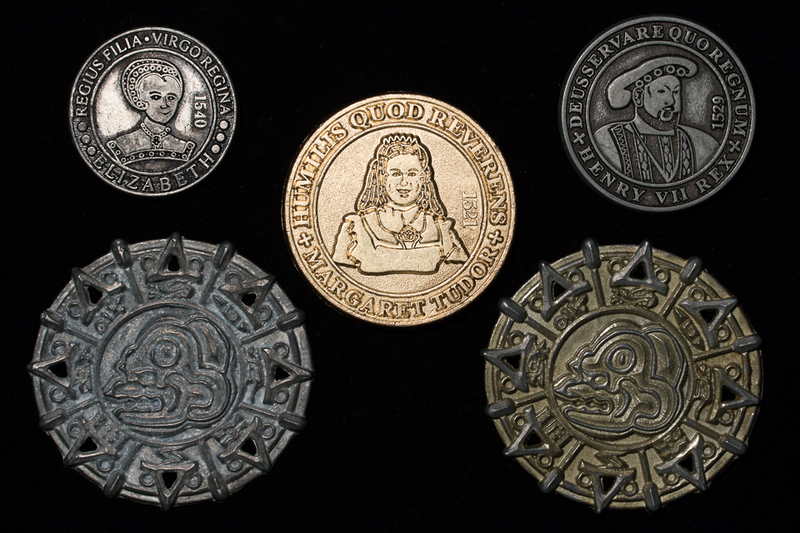 The Coin of the Realm. If you want to get a more realistic experience of what it was like to have a pouch of coins on your belt for all your daily monetary transactions, you can experience it at the Oklahoma Renaissance Festival. The first time I received one of these coins I was purchasing something to drink and got one in change. I hadn’t seen them before so was a bit taken aback. Was it only spendable at that shop? Maybe a way to encourage repeat patronage? Turns out it’s good anywhere at the faire. You can spend the coins just like you would those odd little pieces of green paper that people seem so attached to with strange people on them. It’s not limited to the pubs. Any vendor, performer, etc… will take them. So you can buy a musician’s CDs, shop, or tip a performer with them. It turns out that there’s a bank in one of the lanes on-site (near one of the pubs – Hmmmm. OK it’s also near the chapel as well!) where vendors, performers, or anyone can walk up and exchange modern US dollars and these coins back and forth. Of course, they use a modified definition of a Pound ( £ ) to keep things easy for everyone. One dollar US = one pound and everything is still decimal-based. Trust me, if they used the “real” pound, pence, shillings, etc… everyone would be confused! Prior to Feb. 1971 coinage in the UK (pence, pound, shillings, etc…) was not decimal-based. Frankly I don’t know how they would have been able to keep it all straight in back then. Maybe we’ve gotten dumber since then, or they were really much better at math back in the day! Back to the faire, the coins are fairly heavy, if you get a lot of them and just drop them in your pocket, you’ll definitely feel the weight vs today’s change. 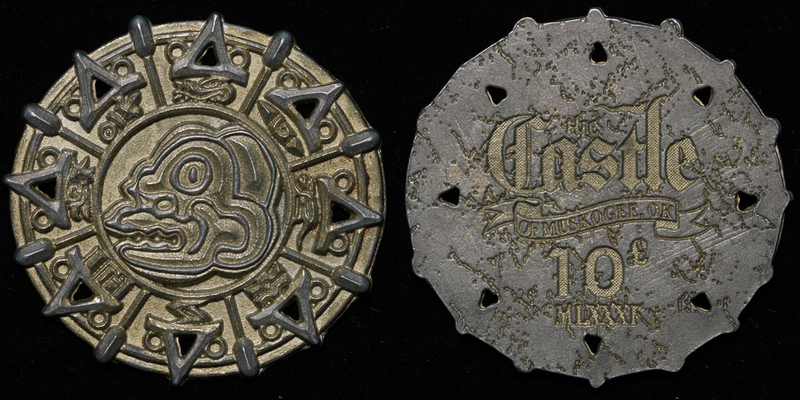 The designs are kinda cool, though I’m not a particular fan of the 10£ “Aztec” (of which there are 2 variants as you can see). It seems just too out-of-place vs the other coins. 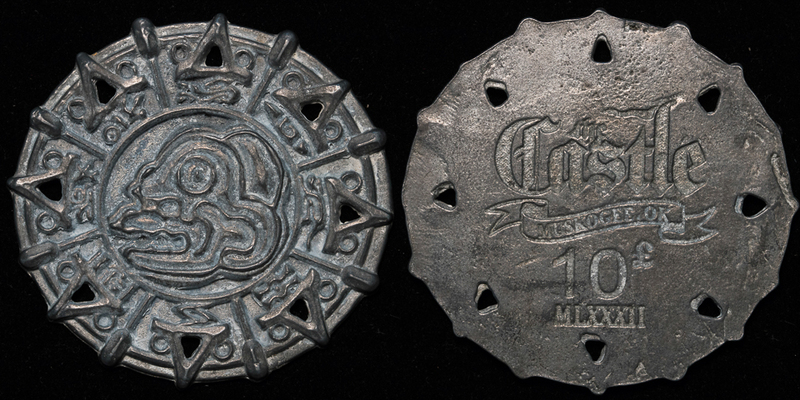 None of the OKRF coinage designs are replicating any historical coin design or physical weight of the “real” counterpart of the day, they’re just made for the faire. 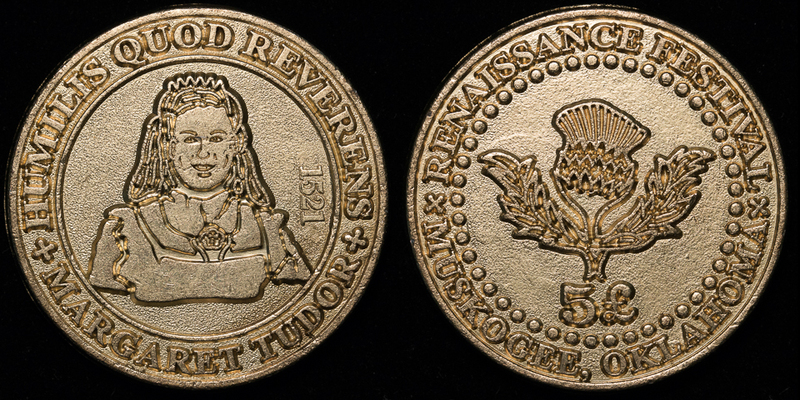 The only similarity is that usually the reigning monarch would be on the obverse of the coinage when The Royal Mint needed to strike-up a new batch of coins. Note: There is one other OKRF coin that I don’t have a sample of. Apparently a few years ago they minted a 20£ coin for their anniversary. Those were basically collector pieces and don’t show up often. I’ve not seen one in person. 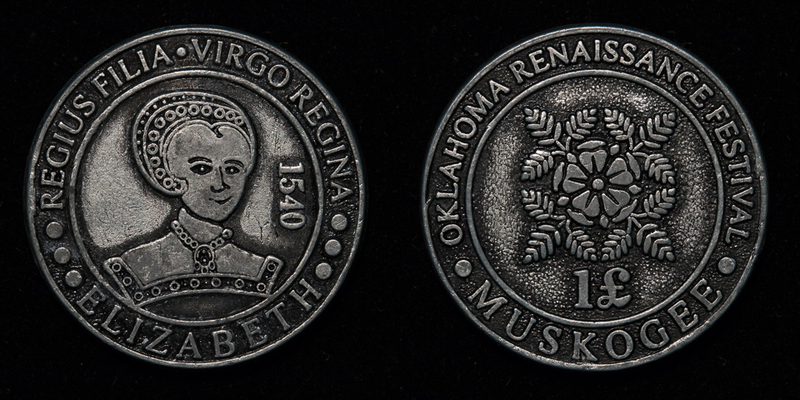 So next time you go the Oklahoma Renaissance Festival, drop by the Royal Bank and exchange some cash for coins. It’s actually pretty fun to pay in coins and you can always convert the coins back to cash before you leave for the day, and if you forget you can spend them next year when you go back! 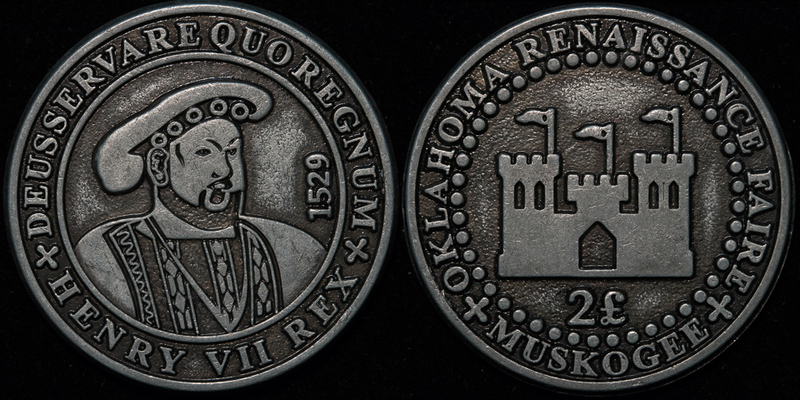 This entry was posted in renaissance festival and tagged coinage, coins, Oklahoma Renaissance Festival, OKRF. Bookmark the permalink.